We're cooking up these scrumptious Mushroom Pizza Bites tonight from our MWLC recipe book. If you're a pizza lover and you're looking for a healthy alternative, you have to give these a try! These make a great snack! Cook tomatoes and onions with water and seasonings until a sauce is made, add ½ pack of Truvia to add a little sweetness. Set aside sauce. Remove gills from mushroom and pat dry. 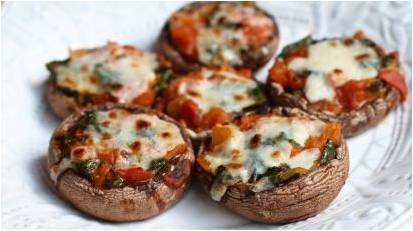 Bake the mushroom in the oven at 350 for a few minutes to cook water out. Put cottage cheese, the other ½ pack of Truvia and fresh or dry basil into food processor, blend until creamy. Spoon sauce onto mushroom and cottage cheese mixture on top. Bake for another 5 minutes and then turn oven to broil to get cottage cheese mixture to brown and melt. Serve and enjoy.